A team of international scientists—from the U.S., Canada, Australia, and Argentina—finally embarked on an expedition in January to see if they could find these so-called Type D killer whales. According to an announcement issued Thursday by the National Oceanic and Atmospheric Administration, they succeeded: A curious pod of about 30 whales appeared to the researchers off the southern tip of Chile and stuck with the team for more than three hours. This marks the very first scientific expedition to collect data on the animals. Taken under Chilean Sub-Secretary of Fisheries and Aquaculture Research Permit, Res. Ex. 1811 and Res. Ex. 4402. Before this trip, all people really knew about Type D killer whales was where others had spotted them: the southern Indian Ocean, New Zealand, and especially south of Chile. That was all the information the team needed to go and learn more. Now, the team has three pencil eraser-sized samples of blood and tissue that scientists will run genetic tests on to determine if the Type D killer whale is, in fact, an entirely new species. It very well could be. 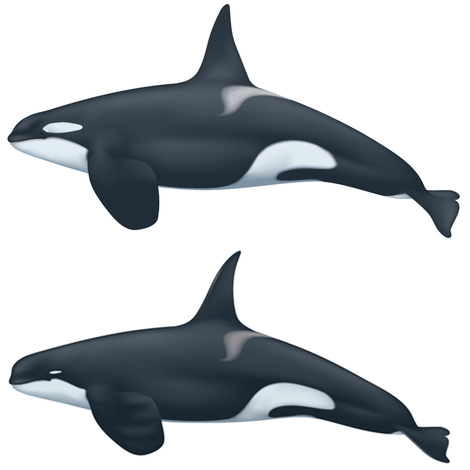 The animal features some notable differences from other killer whales, including a white eye mark that’s dramatically reduced in size, a dorsal fin narrower and pointier than usual, and a signature round head. It looks more chill and stoner than your usual killer whale. However, it traverses subantarctic waters where other types of killer whales swim, too. And there’s a chance these killer whales are facing issues similar to those of its relatives. Along with tourists, fishermen are the ones who’ve sighted these animals the most. As a result, scientists already know that the Type D killer whale and humans share at least one interest: the toothfish, known more commonly as the Chilean sea bass. Apparently, the killer whales aren’t shy when about going right up to fishing vessels and pulling on their lines to steal their fish, Ballance said. That may be why the whales were so willing to approach the research vessel, she hypothesised—in the hopes that it was a fishing boat. However, this behaviour creates a conflict that marine ecologists can’t ignore. While there’s no indication Chilean fishermen have reacted aggressively to Type D killer whales, other fishermen have been known to illegally shoot at depredating whales. After all, the whales’ behaviour threatens their livelihood. Besides conflict with humans, there’s another obvious threat: climate change. The team still has so much to learn about the whales and how this global crisis may be impacting them, but we already know climate change is warming the oceans, which messes with marine ecosystems in countless ways. These animals might not deal with the awful vessel traffic other whales do, but they live near some of the world’s fastest-warming waters north of the Antarctic Peninsula. For now, scientists need to learn the basics. How many Type D killer whales exist, what else do they eat, what threatens them, and are they healthy or are they at risk? So many questions remain, but one thing is certain: The ocean remains full of mystery and potential discoveries.